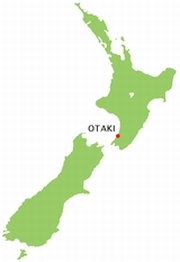 Otaki is a town in the Kapiti Coast District of the North Island of New Zealand, situated half way between the capital city Wellington, 70 kilometres to the southwest, and Palmerston North, 70 kilometres to the northeast. It marks the northernmost point of the Wellington Region. The town's population is 5600 (2001 Census). 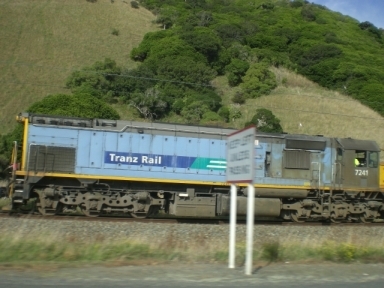 It is located on State Highway 1 and the North Island Main Trunk railway on their routes between Te Horo and Levin. The town is sited close to the banks of the Otaki River, some three kilometres from its outflow into the Tasman Sea. It is divided into three main parts, Otaki Beach which is a mainly residential area, the larger and more inland Otaki township which contains shops and residential areas and along State Highway 1 near the railway station, the part known as 'Otaki Railway'. The surrounding district is largely agricultural, with market gardens, and the economy of the town is largely based around service industries for the farming community. In the early 19th century, the area was inhabited by Māori of the Ngati Raukawa iwi who had migrated from the Kāwhia area from about 1819, under the leadership of Te Rauparaha. They had supplanted the Rangitāne and Muaupoko people. The nearby Raukawa marae is one of the points of interest of the area, along with one of the country's oldest churches, Rangiatea, which dates from 1846. Inland from the township is a racecourse where the annual Otaki Maori Races are held.